The central aim of this course is to make something new and wearable from old, or broken, items. Students can share, or swap amongst themselves and add beads and stones from the huge collection of pearls and beads brought by the tutor. 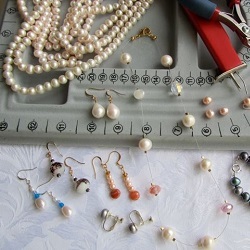 The course includes all the required new wires and clasps to make something fresh. New jewellery can include necklaces, bracelets, pendants and/or earrings (clip on, or pierced). Skills learned on this course can be transferred to other jewellery-making and crafts. All tools and materials are available from the tutor. NB: This course is designed to create costume jewellery. It does not include soldering, precious metal work, or setting gemstones and does not include the mending of fine jewellery pieces. Frances Benton is a trained teacher and a lively story-teller and promises an entertaining and informative course! Frances Benton has been making jewellery and pearl-knotting for many years, having begun her interest in pearls when she was in her twenties. Forty years on, she still travels the world to source her pearls and is an accomplished jewellery-maker, selling her unique pieces all over the UK. She is a registered WI speaker on 12 UK Federations and has been giving talks and demonstrations to WI’s all over the country for 3 years. Students are asked to bring a quantity of broken, or unwanted jewellery items and loose beads. Ask around your WI for donations, or go charity-shopping with renewed energy! Cost of new materials required are included in the price of the day school. Approximate cost of basic new materials to produce wearable items is around £15. Students may use only their own materials, or they may choose to spend more on the day.